You can resort to myriad ways to enhance the setting and feel of your back yard. There is truly no limit to what you can do as long as you don’t violate the building codes. You can spend a small fortune or you can opt for rather humble ways to deck up your back yard. 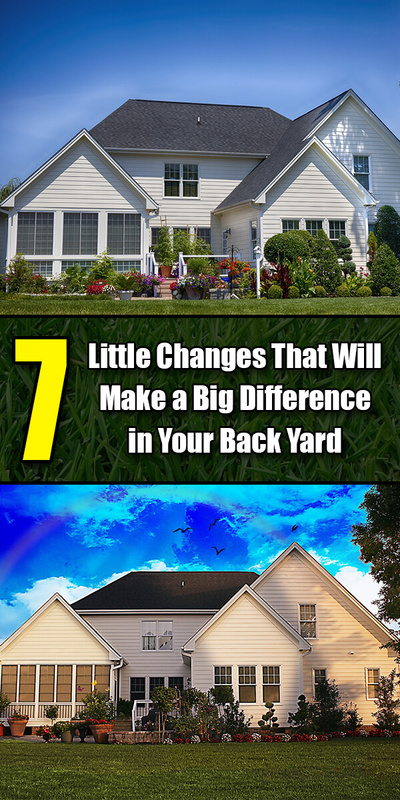 Here are seven little changes that will not cost much but will make a big different with your back yard. Small backyards don’t have enough space for planters, flowers or any kind of natural produce really. Even if you have enough space, a large garden or lawn may not be a priority. It could be lack of time or the effort needed. You can always use the vertical real estate available in your backyard. If you cannot expand the little planters or flowering plants horizontally, you can always opt for a hanging garden. You can use crates, racks, strings or any other typical and ingenious way. Don’t go too high as that would become unmanageable but you explore as much as you can. Don’t block sunlight though and let the views be as unhindered as possible. Use mirrors in your back yard. You may have woods nearby or neighboring homes. There will be a landscape around your house, which could be natural or artificial. Use mirrors that reflect the surroundings and that will add depth to your backyard. Even the smallest backyard will have a desirable character with reflecting mirrors. You can go for vintage or rare mirror frames. Orchids are a great way to change the very ambiance of your back yard. Orchids demand time and you need to find the right combination but once you do your back yard would smell like a dessert. Orchids are also beautiful and they can be a topic of discussion when you are hanging out. A water fixture can really change the setting of a back yard. It doesn’t have to be a pool or a pond with fishes. It can be just a small feature where you have only water and perhaps a few rocks. It could have some plants or weeds as well. Try a mobile pit. It could be a fire pit, a place where you would host the barbecue and it may also be just a small dugout kind of thing where you would keep drinks, packaged goods and other items. Consider putting green or faux pas grass. Small backyards don’t always have natural grass and investing in a lawn is again a tough ask. Faux pas grass or putting green is a great solution. Consider recessed lights, preferably with highlighted accents. The accents could be hanging or fixed at the walls. Recessed lights could be in the walls, in the floor or embedded in the ground.